For quite some time, I’ve been using a simple spreadsheet system to manage my finances across each pay period. I check this sheet multiple times throughout the week to ensure I’m up-to-date regarding what I have available. This helps me to make informed decisions with a clear understanding of my immediate/short-term spending needs. Like most people who are in conventional employment situations, I am paid bi-weekly. I’ve set up my bill payment cycle so that I pay my rent on one pay cycle, and my remaining bills on the following cycle. Approaching my finances from the standpoint of this two-week cycle simplifies the process of managing my spending. To illustrate my method for using this spreadsheet system, I have come up with a hypothetical scenario which I will walk through. Lily is 28, and lives in Baltimore, MD. She graduated college with a degree in accounting, and has since become a certified public accountant. She has been working as an accountant for six years. Upon graduation, Lily accepted an entry-level position with a firm in Baltimore. In her six years of service, she has been promoted twice, and currently earns an annual salary of $70,000. Lily has chosen to contribute $10,000 per year to her employer-sponsored 401k plan. Her employer also assumes a portion of her monthly health insurance premium, leaving her to pay $100 per paycheck out of her own pocket. Using the scenario described above, I plugged Lily’s information into a spreadsheet. This spreadsheet takes taxes and deductions into account, and automatically computes net pay. As can be seen below, Lily is currently bringing home $1,502.45 per paycheck. Lily graduated college with a hefty amount of student loan debt, which she is currently in the process of paying down. She also owes money on a loan for a used car, which was purchased while in college. Aside from these loans, Lily has ensured not to amass any credit card or consumer debt. After the above expenses, Lily has decided to use her remaining money for discretionary spending or saving. For simplicity, let’s assume Lily’s checking account balance will be $0 when she gets paid next, which is on Friday. Friday comes fast, and Lily’s bi-weekly paycheck ($1,502.45) is direct deposited. With this paycheck, she is planning to pay each of her monthly bills, aside from rent. She opens up the spreadsheet and plugs in the numbers as can be seen below. 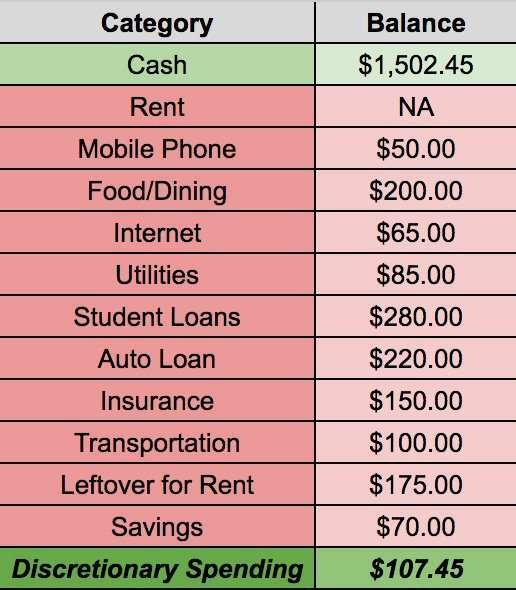 Note: Because Lily has budgeted $400/month for groceries/dining out, and $200/month for transportation, she allocates half the amount per paycheck for each of these line items. This is because there are normally two paychecks per month. Lily knows that she will need to leave some money in her checking account to cover rent and discretionary spending on the next pay cycle, so she has set aside $175 to remain untouched. Having noticed that she has $177.45 of discretionary spending available for the next two weeks, Lily decides that she would like to save a portion of it. She decides to transfer $70 to her savings account, leaving $107.45 available for discretionary spending. 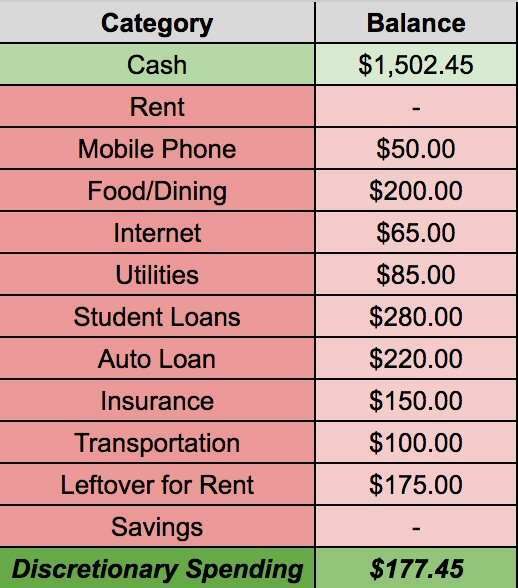 Without the spreadsheet giving her this information, Lily would probably have instead spent that $70 on a night (or two) out. Good on her for taking her spending into her own hands, every little bit counts! Lily makes it through the two weeks just fine. She had to make a few sacrifices, but having peace of mind makes it worthwhile. In fact, she has an extra $10 of unspent money remaining in her discretionary spending pool. Her next paycheck is direct deposited on Friday, and rent is due on Monday. Having set aside $175 from the previous paycheck, and the additional $10 that went unspent, Lily has $1,687.45 in her checking account upon getting paid ($1,502.45 + $175 + $10). This cycle is repeated for each pay period. As Lily becomes more attuned to her expenses and spending, she is able to make more informed lifestyle decisions, saving additional money in the process. The scenario presented here leaves out a few nuances I’d like to mention. I throw all of my spending on credit cards, to accrue reward points to later be used for travel. On my personal spreadsheet, I have added line items for each card and the outstanding balance. This helps to reconcile against my checking account balance, which may be misleading if the card balances have not been paid yet. Note that you should only use credit cards if you pay the balance in full each month. If paid bi-weekly, there are 26 paychecks per year. There will be a couple of months each year where there are three paychecks. 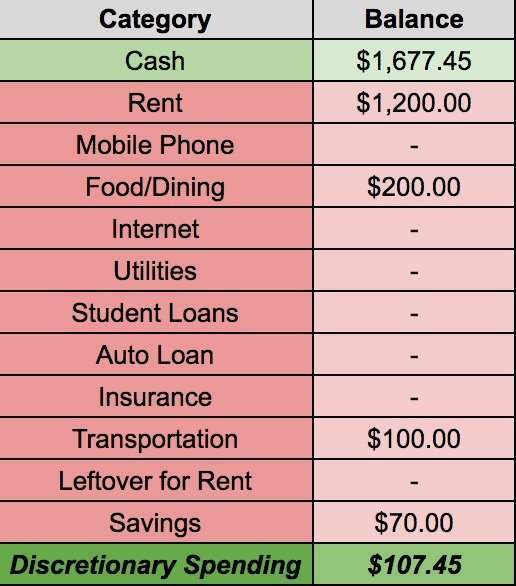 On these months, I am able to save a higher amount since a paycheck does not need to be dedicated to rent or bills. I find that with the simple spreadsheet system outlined above, I don’t need to worry about specific budgets. The money left for discretionary spending can be used completely guilt-free. This system is independent of any savings or investment accounts – it only tracks money available in your checking account for essential living expenses and discretionary spending. Once you have a clear picture of how much you can save each month, money can be routed to savings/investment accounts automatically. The spreadsheet can then be used to properly manage the money left over for living. To have a healthy financial life, a clear understanding of essential expenses and discretionary spending is mandatory. How are you managing your monthly spending?